As most of you know, our kids names are in alphabetical order: Grace, Haven, Immanuel, Josias, Katriel, Louise. No, we don't expect we will finish the alphabet. We also did not plan to have them in alphabetical order when we named Grace. Nor did we expect to have 6 kids. But once we had established the pattern we had to stick with it for Baby K and Baby L. So I started the search for K and L names. Being a teacher ruins a lot of names for a person. We didn't want anything too trendy. Or too common or too weird. We wanted something with beautiful meaning and probably French names, since Congo is a French speaking country. We found the K name pretty easily, but we really had a hard time finding the perfect L name. We had already chosen Lisette for the baby girl we lost to malaria, so when we had to go back to the drawing board for another L name it was not easy to choose. But then a light bulb went on and we found the perfect name for our girl. So on to the names. Katriel--pronounced "Cat-tree-el". Means "God is my crown". Judith-- pronounced "Judeet". Means "of Judea". 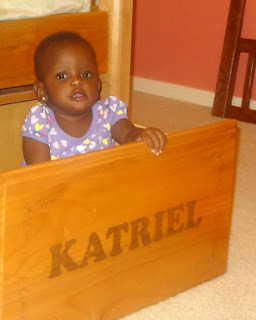 I don't know what it was about the name Katriel, but I liked it right away. It sort of sounded French like Manny and JoJo's names. We thought about spelling it Katrielle, but that looked too fussy to me. It is pronounced with the emphasis on the "el" not on the "tree". Her middle name was the name she had when we got her referral. It is not pronounced the way we would say it here in the states. It seems to be a pretty common name in Congo. Her nickname will likely be Kat. I think the name really suits her. Although she is just 7 months old she already seems to have a very delicate feminine sort of personality. She has stunning fine facial features. She's a baby you can just stare at for hours. Louise--common French name meaning "fame and war". Josephine--common French name meaning "He will enlarge". We liked Louise because it was a common French name, but the name is mostly sentimental. Louise was my great grandmother. It is also my middle name, my mother's, and my Grandma Grace's middle name. And my other grandmother is named Lois, so it is a close derivative. But most importantly, it is the female version of Louis, which is the name of our children's foster father. Josephine is the name of their foster mother. These two people have fostered all 5 of our Congolese children, nursed them back to health and loved them like their own. They are real living saints and I am so happy that one of my girls will share their names. Her nickname in Congo was Fifi, which totally cracks us up and makes us think of a pink poodle. Her nickname from me at least will probably be Lulu. Just wait until you meet Louise. She is going to make you laugh and very possibly try to kiss you. So there you have it. The story of the names. Isn't it funny how a name turns out to be just perfect even though you're choosing it for someone that you've never even met before. These names are perfect for my girls and these girls are perfect for my family.